18/10/15 – Added chip tune demo tribute thanks to Aaron White! 04/09/15 – Added Crazy Hack of Level 3 preview by Vinny Mainolfi. 03/09/15 – We’ve done it!!! Case closed! 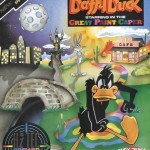 “Daffy Duck – And The Great Paint Caper” was to be one of Hi-tec’s first new Premier Range titles, making great use of a recent licence agreement with Warner Bros. As a result, the title was to be bigger and better than previous Hi-tec titles – resulting with Daffy being a large multi-load based title. In development for almost 12 months across platforms such as the Spectrum, Amstrad, Amiga, ST, PC and finally C64 – there was very little actually mentioned about the game in the press. The Spectrum scene seemed to know the most, with magazines having news snippets and a preview in Crash magazine. 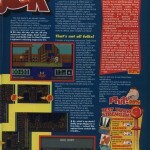 The C64 scene was surprised with a review of the title out of nowhere in the August 1992 issue of Zzap 64. The game wowed the Zzap team, and the game scored the highest ever rating ever for a Hi-tec game, with a grade of 94% overall (Phil King himself gave the game 95%) – making the game very desirable for many readers at that time who were still with the C64. 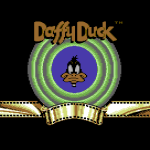 Featuring awesome graphics, including a incredible Daffy sprite, various different levels and other Warner Bros characters.. the game remained faithful to the cartoon in many ways. The game played extremely well, solving various puzzles and collecting objects, the only fault was the music not fitting in with the game (Even though Gerard did a great job anyway according to the Zzap crew.). When nothing appeared on the shelves, news later filtered through that Hi-Tec was no more – and Daffy didn’t quite make it to the mastering stage to sneak out (with only Turbo the Tortoise managing that feat). 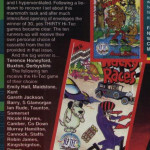 Rumour had it that WH Smith received 250 copies before Hi-Tec folded, all of which sold – giving speculation that the game was out there somewhere in original form. David Palmer however confirmed that it never got to the mastering stage. 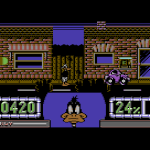 Although Turbo got picked up by Codemasters, the licence costs for other Hi-Tec titles were too much to bear, and so Daffy Duck was never to be seen on any of the promised platforms and slipped into legendary unreleased game status. 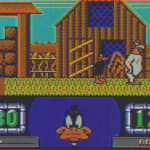 Since GTW started life as a magazine article in Commodore Zone back in 1997 – one of the very first titles that became top of the search list was Daffy Duck. When this very online archive was first started, it was initially a case of asking around if anyone had a copy which could be added to the website. With games like Gauntlet 3 already in the wild, it was assumed a similar fate could have befell Daffy – but this wasn’t the case. Interest grew on websites and forums as the internet grew, with people asking what happened to the game and if anyone had it. Very quickly the game become one of the most wanted of missing games on the C64, with an almost “holy grail” status, mostly due to the high score it had achieved in Zzap 64 increasing the desire to play it. 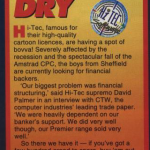 At the time, the developers were not known, so attention was turned to finding David Palmer from Hi-Tec to find out more. Once tracked down, David gave massive hope by saying that he still had all the master disks from those days – and a search was started. 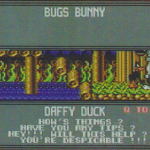 Concept art was dug out, and even a full copy of the unknown Bugs Bunny – Private Eye was found and sent to GTW64 to preserve, but there was no sign of the elusive Daffy Duck. During this time, it was also established that the developers of Daffy Duck were none other than the famous duo, Ash and Dave. Contact was also established with both and worst fears were confirmed. Programmer Dave Saunders had long rid of all his C64 and work disks, and Ashley Routledge was confident that he had nothing of the game. Searches were kicked off regardless and all proved fruitless. Even musician Gerard Gourley sadly had nothing of the game (not even the music), and neither Nick Taylor who worked with Ash and Dave numerous times. As the years passed, GTW contacted many different people involved with Zzap and Commodore Format – seeing if they could recall what happened to any review copies of games. Zzap had everything sold off when Impact Magazines was liquidated, Commodore Format infamously burned such things in almost ceremonial fashion. Even other developers, project managers and staff involved with Hi-tec were tracked down and questioned to see if they might by remote chance have something of the game. Even the Hi-Tec competition winners were all contacted to check if they may have been sent a copy as part of their prize (which gave some bemused responses). Again – nothing, and by now the search was becoming desperate and all avenues closing one by one. With many let downs, and then subsequent false claims of game ownership and fake auctions over the years – the search went on undeterred. 2014 saw the start of a multi-format article on the game as a side project for GTW – talking to all developers and leads who had been contacted previously to cover the game in full across all the formats it should have been released on. This proved useful in unlocking a lot of previously unknown information about the game – but it led to a surprising development which came completely out of the blue. When speaking again to Ashley Routledge, Ash casually dropped into conversation that he still had all of his C64 disks, and it seems subsequent sort outs after our first attempts had located them finally and were now laid in rest in a known part of his attic. 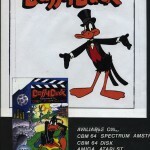 Still not confident that he would have a copy of Daffy Duck, GTW offered to digitally preserve all of Ash’s disks anyway to potentially preserve any unreleased artwork and demos (including potentially lost CompuNet titles and any unreleased Ash and Dave demos). 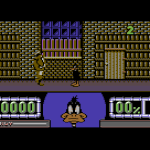 There was also the chance that, at the very least, that graphical assets (and maybe even demo builds) of Daffy could be found and recovered. In the August of 2015, Frank set off to Ash’s home town in the Midlands to meet up for lunch with both Ash and Dave, and to collect Ash’s disks in person. When showing the disks to both Frank and Dave before handing them over, excitement built when several C64 disks were shown with Daffy clearly written on the labels. But most exciting was the additional box of 3.5” floppies which Ash had found with his collection. This set of disks were given to Ash by Dave (and long forgotten about). Although Dave had rid of all his old C64 work, it seems he had backed up all of his development system and gave it to Ash. 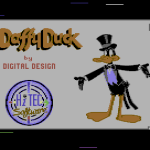 Here there were about 6-8 floppy disks with complete PDS source code for Daffy Duck, which was WAY more than could ever be expected to be found. It started at that point to feel like a chapter could be about to finally end, but it was still early days and would the disks even still work? Excitement was understandably building, but still with plenty of apprehension. 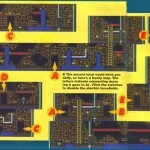 Once home, excitement continued when a test executable of the Sewer level was found very early on, followed by the intro sequence and loading picture. But as feared, there was no complete game on the C64 disks that was ready to run – and the majority of the disks contained just sprites, charsets and map data. The saviour was to be with the set of backup disks from Dave in the end, which loaded perfectly and all sources and assets were fully recovered without any problems. Martin Pugh was now tasked with the painstaking process of trying to make sense of the source files – but amazingly within only a few hours, Martin was running Level 1 from the game via 486 emulation. There was a problem though – version 1.21 of PDS 6502 was needed to get things compiling smoothly, and without it – it would be a massive pain in the backside to get everything going. By pure luck, Frank had been hard at work already preserving all of Ash’s disks, and the night before had only just backed up a disk labelled PDS 6052/Z80. The disk had been heavily degrading, and the files were just about copied off the disk before the magnetic layer wore away completely. After sending these files over to Martin, the response was emphatic when it was found to be the missing piece of the jigsaw puzzle. A few hours later, we were seeing Levels 1-7 all up and running for the first time in almost 25 years, and a huge sense of relief was felt that the game was finally saved. There was still plenty to do however, and a lot of head banging ensured to stitch everything together properly into a complete game with its multiload, intro sequence and end sequence. Martin superbly delivered the goods though and (along with assistance from David Simmons) has helped to recover one of the most important lost C64 games of all time. 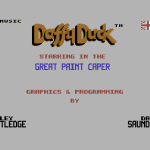 And so with a massive deep breath, we are proud to FINALLY present Daffy Duck and the Great Paint Caper! Unfortunately the full game story has not yet been recovered – but hopefully some day it will. The details below are based on snippets gathered from research and from the game itself. 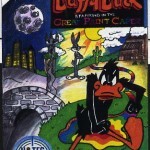 The game puts you in control of Daffy Duck, who must work through 7 levels to try and restore colour to Looney Tunes town once more, after paint has been stolen from the local stream which provides colour to the town. 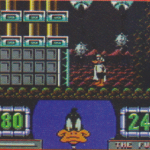 You start off at the ‘The Studios’ and each level involves you having to solve a series of puzzles by talking to characters (such as Bugs Bunny, Road Runner, Foghorn Leghorn and more) in the game using an interactive menu to obtain help and clues. This will help you to locate the correct objects to progress and get to the next level. Every level contains a set of obstacles that you must overcome by using the correct object in the correct place, and avoiding a variety of enemies. You only have the one solitary life – hitting enemies will reduce your energy level, and once empty it is Game Over! Some enemies can be temporarily stunned by jumping on top of them. Following on from the studios you must work your way through ‘The Sewers’, ‘The Desert’, ‘The Country’, ‘The City’, ‘The Jungle’ and finally ‘Mars’ to complete your mission. Pressing FIRE whilst in front of a character will open up a dialogue menu (Q to exit). Use joystick and fire to highlight and choose a conversation option. Holding down FIRE and pressing up in front of doors will make you enter them. He splutters worse than Roy Hattersley and plays havoc with his many furry friends. Yes, PHIL ‘QUACKERS’ KING gorges himself on a seven-course cartoon fest with orange sauce! Forget Disney ‘magic’ – for me, none of their cutey-pie cartoon characters can compare with the likes of Bugs Bunny, Elmer Fudd, P-P-Porky Pig and, of course, Daffy Duck. He may wear a dog collar but he’s no saint, always getting into trouble – especially during duck-hunting season! Hi-Tec’s quacking arcade adventure has the cheeky little fella performing tricky tasks on seven colourful cartoon levels. He starts off, fittingly enough, at the film studio. A horizontally scrolling corridor contains plenty of nasties to jump over, or on to temporarily stun them, plus doors leading to various rooms and film sets. Some of the characters encountered can be talked to: a menu of set phrases enables you to say ‘hello’, ask what they’re doing and if they have any helpful tips. They sometimes give you useful items, but only if you fetch them another object first. Leaving the film studio behind, Daffy ventures in to the real world and its sewers. 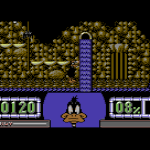 Yes, the second level takes Daffy underground, past gushing pipes and mutant fish as he searches for an exit key. Several electric forcefields stand in the way, and must be turned off by finding and flicking the right switches. The exit leads to an equally hostile desert. And who should turn up here but Road Runner (just try having a conversation with him! ), Wile E Coyote and Speedy Gonazales, who (for some reason) requires a detonator and rocket parts. These are scattered all over the barren, horizontally scrolling landscape with many huge crevasses – crossed by jumping on moving platforms. Like most cartoon characters, though, Daffy can take a lot of punishment; even if he falls down a ravine, all he loses is a bit of energy – which is just as well, ‘cos he only has the one life. Level Four’s farmyard might seem a friendlier environment, but our daring duck has to dodge squirrels, birds and falling acorns while looking for eggs to take to that rapscallion rooster, Foghorn Leghorn. Water also causes problems as, despite the fact that he’s supposed to be a duck, Daffy can’t swim – instead he hitches rides on friendly alligators and frogs. 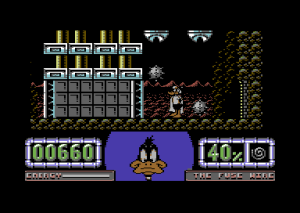 Daffy faces yet more dangers in The City, before helping a pygmy to bake a cake in The Forrest, and finally going out of this world to defeat alien invaders on Mars! It’s been a long time coming, but Daffy Duck has been worth waiting for. You can see the amount of work that’s gone into creating Daffy’s cartoon world with some superlative backdrops and most of his friends making cameo appearances. Of course, Daffy himself is the star of the show, perfectly drawn and animated to perfection. He even wears different costumes to suit each level, e.g. a hard-hat with lamp in the sewers. Equal attention has been shown to the gameplay. There’s nothing revolutionary, but it’s all excellently implemented with each level having a distinctive flavour. With simple controls and easy-to-use speech menus, the game’s easy to get into and very compulsive, though I don’t think it’ll hold that much challenge for experienced players. Nevertheless, there’s a big incentive to see new levels and meet favourite cartoon heroes. It’s a shame some of the latter are just static figures, but nice to see them there nonetheless. Whether the game would be so enthralling without the well-known characters is purely hypothetical, but the gameplay’s strong enough to appeal even if you find Daffy dethhhpicable! CORKY – Cue a small black duck grabbing his beak (which is at the back of his head), and twisting it round while lisping ‘You’re dethhhpicable’. 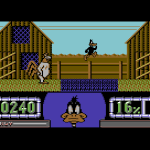 Daffy Duck’s my second favourite Warner Bros character (after The Tasmanian Devil, mainly ‘coz I sound like him first thing in the morning), and this game’s certainly a goodie. The programmers should give themselves a big pat on the back, ‘coz in both the graphics and playability stakes Daffy Duck’s chuffing brill. The seven levels are mainly collect-’em-ups, with a small amount of problem solving thrown in for good luck. 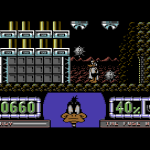 Nothing particularly tough there, you may say, but Daffy Duck’s very playable nonetheless. Daffy’s a cute character who blunders his way through each escapade in his usual mindlessly optimistic way, while many of his pals help out with clues and essential objects. Indeed all of the sprites, both moving and stationary, are masterpieces of computer art. Go out and buy Daffy Duck now, you’ll be QUACKERS if you don’t (groan, your P45 is on my desk – Ed). PRESENTATION – 87% Neat intro, long levels make multiload tolerable. 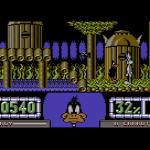 GRAPHICS – 94% Colourful backdrops are superb, Daffy is perfect. SOUND – 85% Jolly tunes aren’t cartoon style but still good. HOOKABILITY – 93% Jumping around collecting objects is compulsive. LASTABILITY – 89% You only have one life to explore varied levels. LOVE THE EPIC INTRO! Too bad I can’t play it in NTSC Mode… But The Intro works in that mode! Hopefully that issue should be fixed someday!